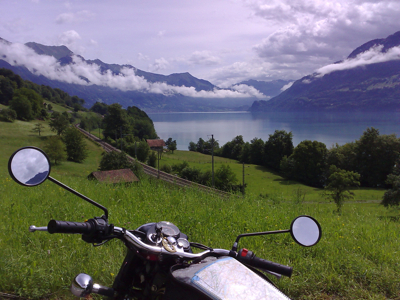 My holiday motorcycle trip of this summer was an interesting one, in the Chinese sense. 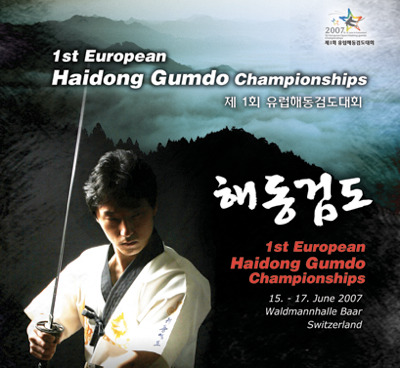 The plan was to first ride to Switzerland to attend the first Haidong Gumdo European Championships, and then continue from there together with Juha to Montenegro. 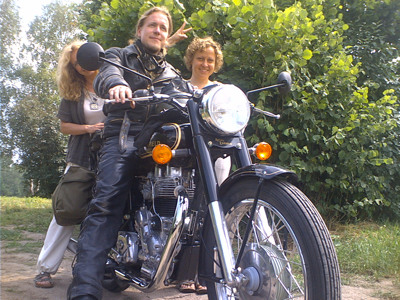 As it happens, Juha never got his motorcycle working, and my trip was filled with various adventures and misfortune, but also with friendly people and beautiful scenery. I left Helsinki on June 9th, heading south following the Via Baltica. My first stop was to Lodz to meet Piotras, the Midgard core guy. From there I followed the nice, curvy country roads of Poland to see Natka and her new country-house near Jelenia Gora. Unfortunately I lost the sense of what bike I was riding, resulting to a tumble in a dark, tight corner. So, the next day was spent repairing the bike and getting my arm x-rayed. From Silesia my trip took me to Czech Republic, and I stopped for the night in the city of Karlovy Vary, destined to be the site of the worst adventure of the trip. I went out for dinner, after which I ran into a local girl who invited me to join her for a drink. Soon we were joined by another local woman. After some chat with them, and a couple of drinks, I suddenly lost consciousness. The next thing I realized was that I woke up in hospital, filled with plugs and pipes, cell phone and Nokia 770 stolen and with no idea of what had happened. Apparently my drink had been spiked. I was struck with paranoia and just wanted out and away. The staff didn’t speak English, but after some attempts I was able to convince them in a combination of German and Russian to let me leave. Once out, I took off towards the border as quickly as I could. In Switzerland I was able to get a new cell phone, and got a rather unpleasant call from my credit card company: the thieves had withdrawn 9,900 EUR (about 13,500 USD) from my card, and the company wanted the money back. I’m still wondering what to do about this, as insurance doesn’t protect from it. 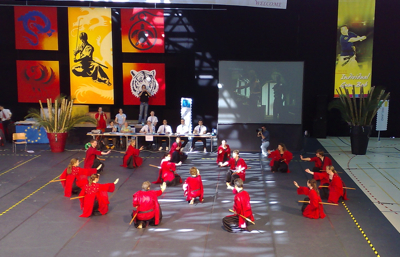 The Haidong Gumdo championships themselves were a well organized and nice event. While my personal performance was hindered by the aftereffects of the drugging and lack of practice on the trip, Team Finland brought home two medals and we had a lot of good time meeting Haidong Gumdo practitioners from other countries. The Night of the Sword gala contained some of the most amazing swordsmanship I’ve ever seen, although the video doesn’t do it full justice. After the competition I stayed at Michi’s place, chatting about various things and getting some encouragement to continue the trip despite the catastrophic drink-spiking incident that had left me without credit cards and feeling physically very weak. At this point it became apparent Juha wouldn’t be able to join me, so I switched Montenegro for riding back home via Hungary and Romania. The next two days were pleasant riding in the Alps. Old towns and castles, mountains and curving passes. But after visiting the Neuschwanstein castle, misfortune again caught up with me, this time in form of an engine failure. A valve seat had became loose, making piston and exhaust valve collide. This obviously required new parts, leaving me looking for Enfield shops in Bavaria. With the help of my “ground staff”, I got the bike towed to Iwan-Bikes, the Enfield dealer near Munich. They had the parts needed, but not the time so we made the deal that I would disassemble the cylinder head, and they would change the parts and put the bike back together. 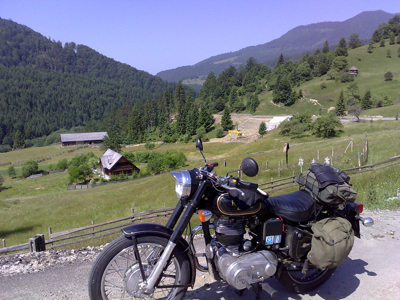 Two days after the engine failure I was back on the road, riding in Austria. After rainy and a bit cold Austria, entering sunny Hungary was a pleasure. I stayed with Ferenc’s family at the lake Balaton, enjoying swimming, local cuisine and home-grown wine. Romania showed itself to be quite a contrast to the Hungarian plain. Coming from a hot, flat land, I was suddenly again riding in mountains. A fascinating country where almost half of the traffic consisted of horse carriages. In the border town of Suceava I felt a bit torn: whether to head home, or make a detour through Moldova and Transnistria to Odessa. Following the old guideline of ”A pig who doesn’t fly is just an ordinary pig”, the decision was easy. But again fate took part in the game. I was riding in the borderlands between Romania and Moldova when the engine decided to stop again. Luckily a border patrol was close and helped me to get the bike towed to nearest city, which in this case happened to be Iasi. After a night in one-star hotel I limped the bike to nearest car repair shop. They didn’t understand much about bikes there, but the shop’s owner was very friendly and helpful. Some phone calls were made, and soon I was in a motorcycle repair shop explaining the problem. The guys started working on the bike immediately, and after couple hours said I could ride. I thanked them, packed the bike and headed west through the city. But in two kilometers the engine failed again, and I limped back to the garage. A new repair attempt was made, more successfully this time, but as it was already late the guys invited me to stay with them and to go to a gathering of local bikers. I spent the night drinking and chatting with the group, and in the morning left with the bike towards Ukraine, the rest of the trip going without incident. I visited Lviv, a city I had seen the last time during the Orange Revolution, and then crossed to the Polish side of the border. Riding in Poland already felt almost like home, and soon I was back on the familiar Via Baltica, taking me through Lithuania, Latvia and Estonia to the port of Tallinn, and on a ferry to home. At this point getting back felt really welcome, as can be imagined. More photos can be found in my Flickr gallery. 18 February 2007. 1 minute read.